Yesterday USD was supported by a dovish FOMC meeting minutes; however, it fell again due to the terrorist attack in Spain. 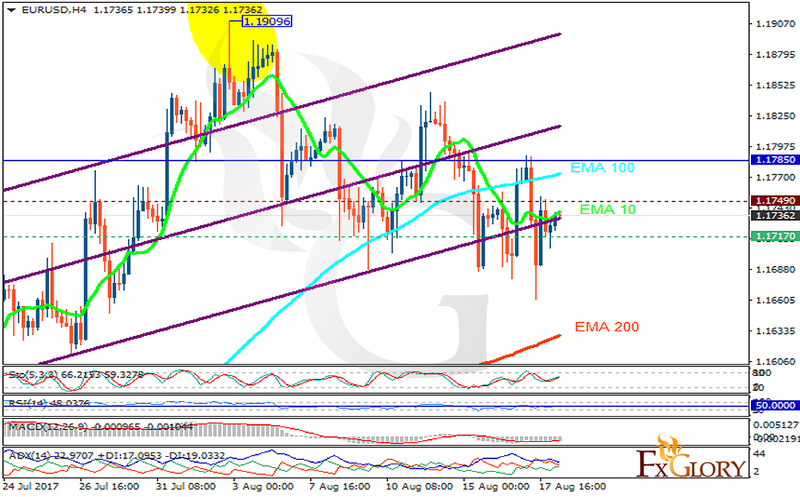 The support rests at 1.17170 with resistance at 1.17490 which both lines are below the weekly pivot point at 1.17850. The EMA of 10 is moving with bullish bias along the ascendant channel but it is below the EMA of 100 and above the EMA of 200. The RSI is moving horizontally on the 50 level, the Stochastic is showing upward momentum and the MACD indicator is in negative territory. The ADX is not showing any clear signals. Long positions are recommended towards 1.18 area.